Good morning sweet friends! Today is Day of Giving Friday and I’m getting ready to send the next batch of cards out. Can I just tell you that when I don’t make a new card for Day of Giving Friday, I take a look through my never ending stash. That’s a great feeling but even more, the rush of memories is delightful. I remember what I was doing and what I was going through with each card. I don’t know why, but this was one of my very, very favorites. Leave a reply if you’d like it to come live at your house. This time around, I decided to do the inside with using the same punch. Easy! The pretty swirl making the frame around the card uses an EKSuccess border punch. I haven’t picked a border punch up in a long time but they’ve always been one of my favorite tools. I figured out an easy way to punch the border on four sides so that it fit and I show that in an older youtube HERE. This especially works with long tall sentiments and there’s also a way to make a square sentiment as I ‘ve shown HERE. It makes a lovely background to an easy card. For new readers, every Friday it’s my pleasure to give away a card. The card goes to a randomly picked reader (worldwide) who leaves a comment in our conversation. Want to know more about Day of Giving, here’s a link to my FAQ’s just check out #11. You can check to see if your name is on the list of winners HERE. For your comment: What trend or tool has come back that you welcome with wide open arms? Very pretty my friend, Becca. Just like Earlene I too am a dieaholic! Can’t stop buying but I have told my hubby if I die first that they are worth a lot LOL. Have a great weekend Becca. What a pretty, pretty card. So feminine and elegant. And a beautiful sentiment, too. Just lovely! Once again you´ve shared such a beautiful card here today. I love the soft gentle touch to it. Your card is just beautiful as always Becca, i like my dies some beautiful new ones coming out ,just wish i could afford them . Love the saying Becca – and, the card. So appropriate for me at this time as we have a tree farm…you really feel in touch with God when walking thru the grove of 40 feet high Christmas Trees planted 12 feet apart so it is a forrest! Smells just like Christmas!!!! Can’t think of any tool that has come back to my use other than a punch or two that I am liking.. Since I am fairly new at cardmaking, even some of the old punches look fascinating to me. I do like to work with them. Hi Becca, this card is so beautifully made. I’ve always loved using punches. I am not sure what is in & trending, but I always seem to find that when I like something & want to purchase it it is old stock. Gotta love google though, it always makes it a challenge to find. What a lovely card and I was very surprised to learn that the openwork was not from a die but from your border punches. Thank you so much for the tutorials! I love dry embossing with brass stencils and for awhile it seemed everyone stopped making them. I know dies can do this too, but even so, I was so happy when I found stencils available again. Isn’t it great to have so many creative tools available to us?! Good morning Becca, what a beautiful card it’s so Spring like!!! Texture paste seems to have made a come back!!! If you wait long enough I think everything makes a comeback!!! Christi I think you could mean Quickcutz. Thanks for reminding me I will hunt mine out I’m sure I have the Alphabet!!! reminds me to thank God for everything. I just like to make my cards to fit the person. Beautiful card as are the previous ones. I would like to see dies that have been retired come back. Graphic 45 to bring back. All the paper pads not just one when they bring back a d/c collection. 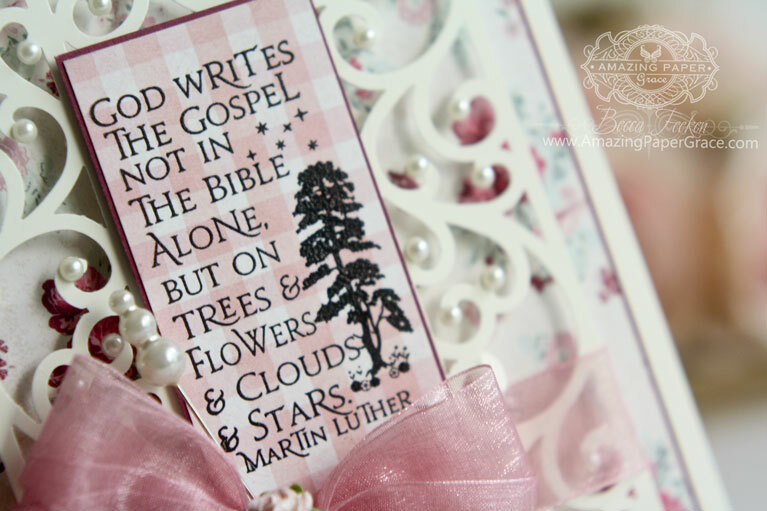 Pretty card the verse lovely it ties the spiritual to the earthly ! I received your very lovely card in the mail this week! It was a wonderful pick-me-up, and I know with whom I will share it! I could really use this card right now. 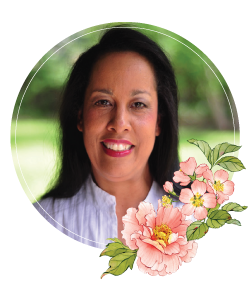 I am going through so many painful illnesses that still are not being treated even after two years of suffering from an infection that has been spreading throughout my body. I am still fighting for the antibiotic I need so in the meantime the Psoriatic Arthritis is running rampant as well which is really painful this time of year. So please keep me in your prayers. Love your card Becca, and I would willingly give it a home here in the antipodes. Lovely card! 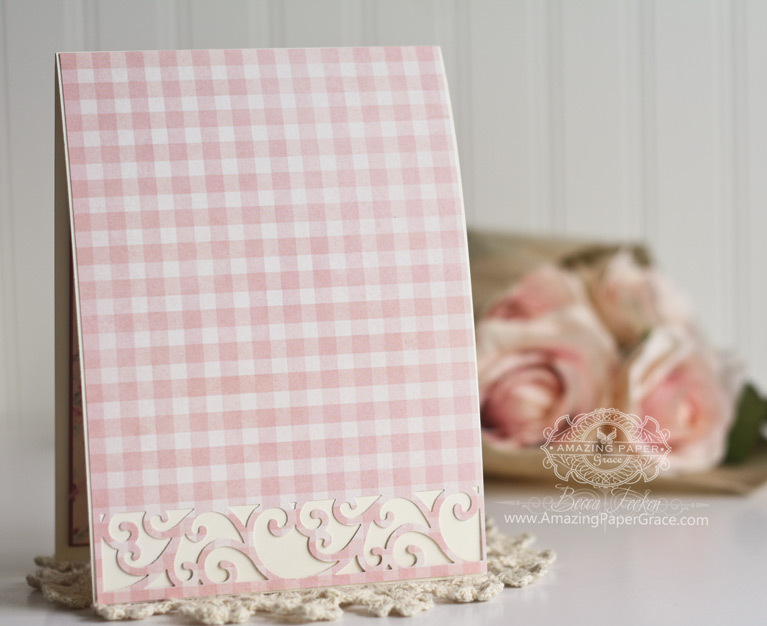 I remember when you shared that tutorial with the border punch, and I bought the punch because I loved the results so much! I am not one to really follow trends or rush to get the latest tool. I tend to do what I like. Punches and dies are a favorite because I don’t like to fussy cut. One Sheet Wonder cards are grabbing me right now. I think the technique took a break, but has made a strong return. Such a beautiful card and a true sentiment. Hi Becca, since a long time I’m a fan of your stunning creations. I love the art you create cards. They’re all so special with a wonderful touch of love. 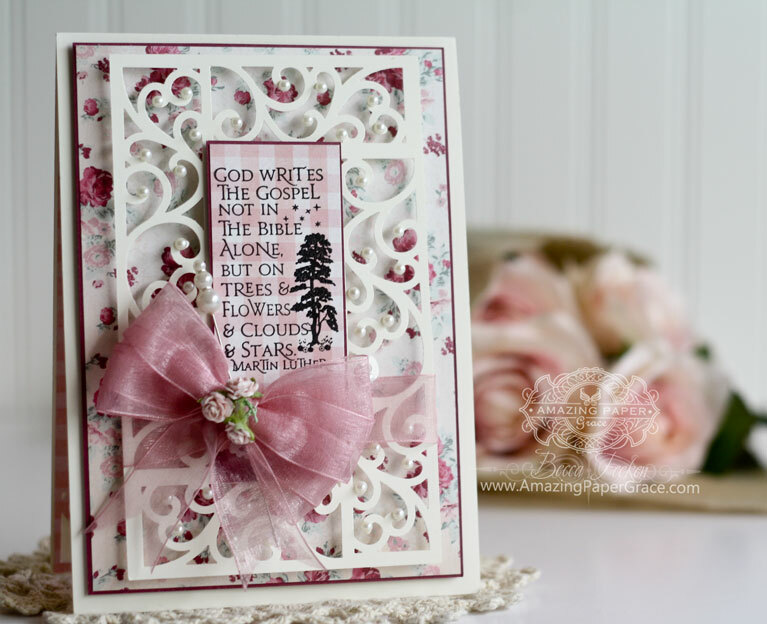 This card is gorgeous again with the beautiful bow, and the sentiment is so true. A gorgeous card, so romantic and elegant! What a beautiful card with the most wonderful sentiment. Stamps. They seemed to have gone out of favour for quite a while with dies being the main focus but I love stamping and colouring, so I’m a happy bunny!! I received my card! Thank you!!! It is so much more beautiful in person than in pix. I will cherish it!!! Hi Becca, A very pretty card, lovely die-cuts and beautiful patterned papers, I love it !! As always you have inspired me to create. Years ago, I invested quite a bit in brass stencils. They have been out of vogue for a while, but I am glad they and embossing paste are coming back. Thank you for what you do; I perceive your sharing as a ministry, especially to those who are home bound or temporarily out of circulation. I hope you enjoy this new month of October that God has given us to reflect and incorporate the autumn palette into our card making. Such a pretty card today, as always, I love the verse/sentiment that you have added too. Hope this finds you well my friend. At this precise moment I cannot think of anything that has come back that I’m pleased about lol! I am sure there must be something but not got my thinking head on at the moment!